Australia successfully defend their Commonwealth Youth Games girls' rugby sevens title, while Samoa edge England in the boys' event in Nassau, Bahamas. Australia showed the future of women's sevens rugby is bright after successfully defending the Commonwealth Youth Games girls' rugby sevens crown in the Bahamas on Friday, while Samoa's won the boys' gold medal in a much closer battle with England. Two members of Australia's victorious side from 2015 have already stepped up to play on the HSBC World Rugby Women's Sevens Series in Emma Sykes and Demi Hayes and more will follow in their footsteps. Australia had swept through the pool stages with five wins from five, scoring 213 points and conceding only 22 points - the majority of those in a 24-17 win over Canada in the final match and the gold medal decider was a repeat of that encounter. This time, however, Australia were in control from the outset at the Queen Elizabeth Sports Complex with Lily Rose Bennet opening the scoring. Canada hit back through Taylor Black's try but that proved only a temporary respite with the impressive Page McGregor giving Australia a 12-5 lead at half-time. Further tries from Bennet, McGregor and Georgia Hannaway wrapped up the comfortable 31-5 victory for Australia to the delight of coach Dale Roberson. “I’m extremely proud of this team. We played a clinical game and defended really well to limit Canada to one try,” admitted Roberson. Wales finished on a high by beating Fiji 19-14 to win the bronze medal, while Trinidad and Tobago repeated their victory over Bermuda in the round-robin stages to claim fifth place, this time winning 29-0. Frank Tato then finished off a free-flowing move to give Samoa a 10-0 lead but England ensured a nervous end to the match after Oliver Sleightholme, the son of former England international Jon, touched down to cut the deficit to five points. There was no way back for England, though, and the final whistle sparked the Samoan celebrations at winning the gold medal. 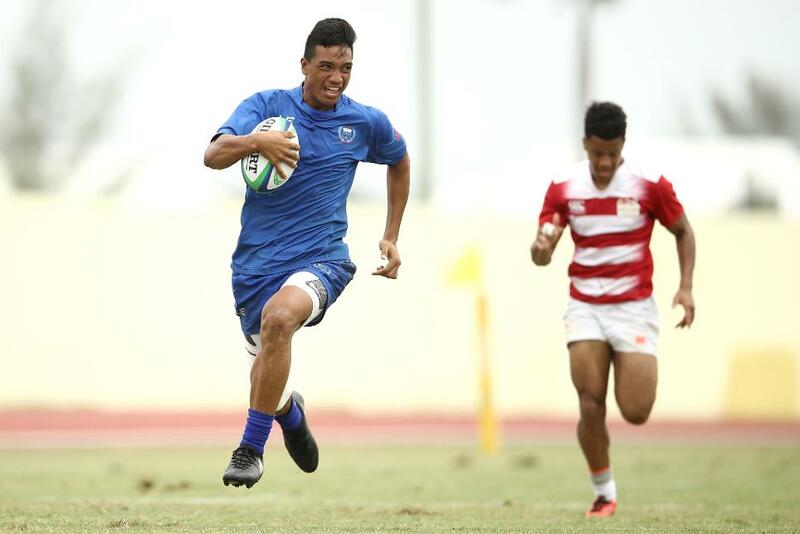 It was Samoa's second victory over England in the six-team competition, having won their round-robin match 19-7 en route to finishing second in the standings. Fiji were the only side to beat the champions with a 15-14 win in the pool stages and they ensured there would be two Pacific Island nations on the podium with a 28-14 defeat of Canada in the bronze medal match. Sri Lanka finished fifth after a 43-5 win over their hosts Bahamas, the only side not to record a victory in the competition.